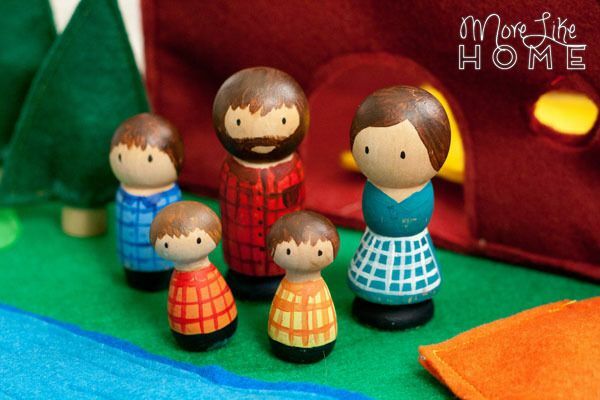 We'll be making a cute little peg family. 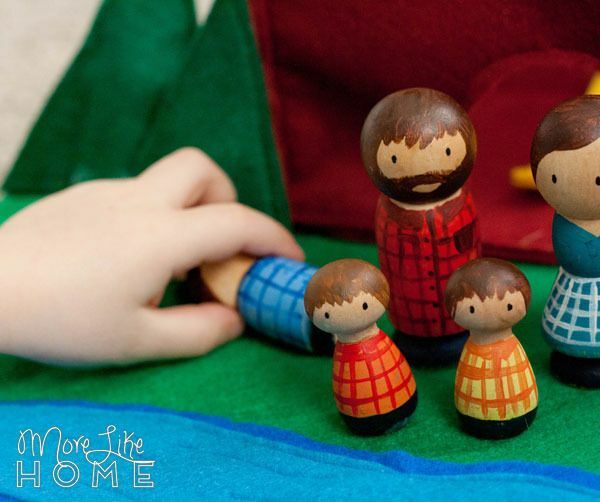 We made a set to match our family with parents and three little boys, but you can do any family combo you like! 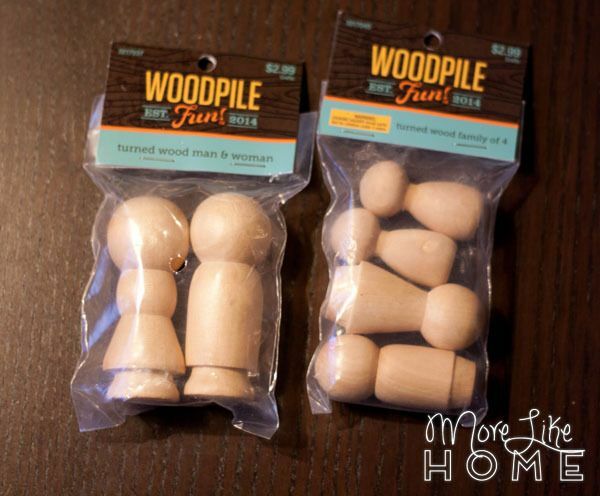 We found all the pieces we needed at Hobby Lobby, but Etsy has tons more options in a variety of sizes if you're looking for something really specific. 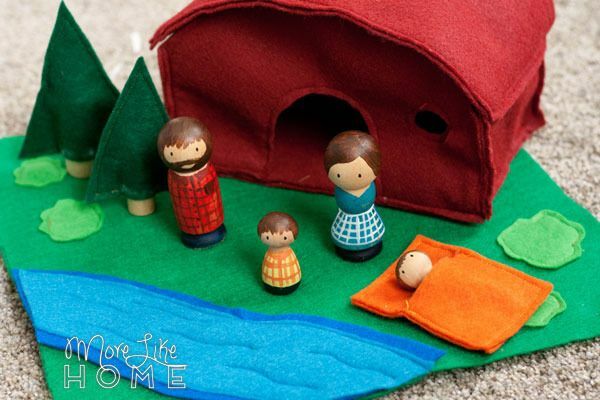 We'll also be making a complete camping scenery with a grassy mat, peg & felt trees, plus a big family-size tent. The top of the tent opens for easy playing! 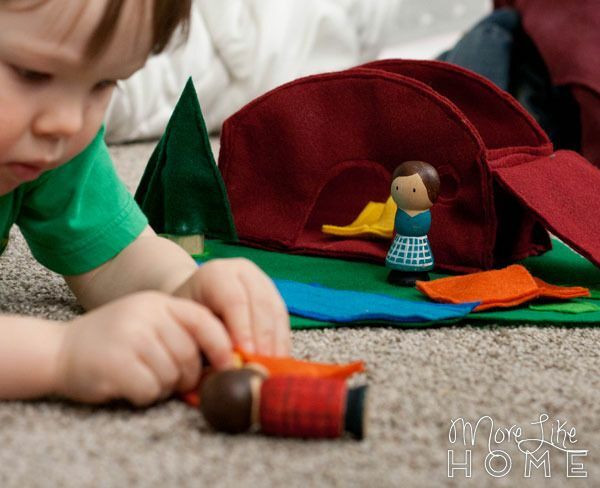 At Hobby Lobby we found these two sets that were perfect for us with parents in one, and three little boys in the other (any left over pegs can be used for trees, too. It was about $6 total for both sets without a coupon. 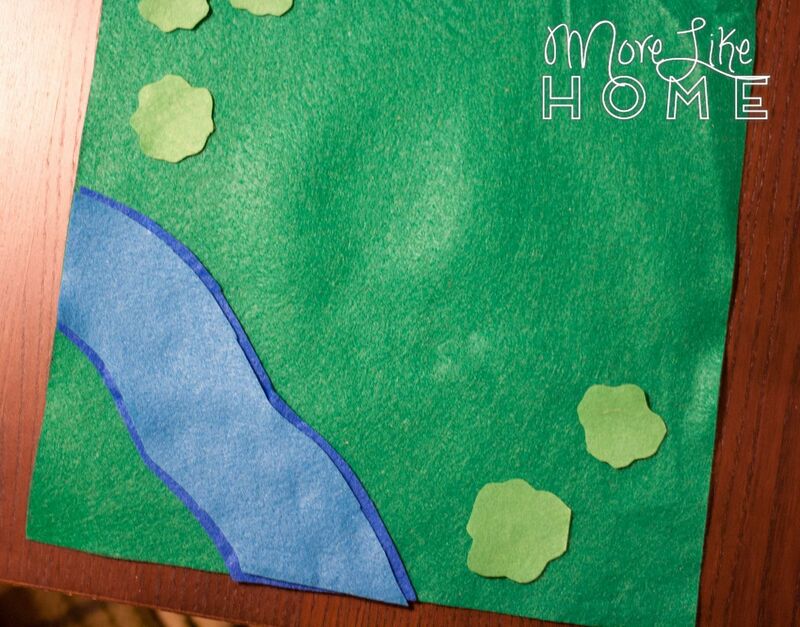 To make the mat, start by cutting a 12 x 12" square from medium green (but it would be fun to make a bigger one with multiple tents if you want a big playset for multiple kids!). Then I free-style cut some bushes from the light green. I cut a river across the corner of my sheet of light blue, then set that on top of the dark blue and cut another just a bit wider to add some depth. Lay all the pieces out on the mat. 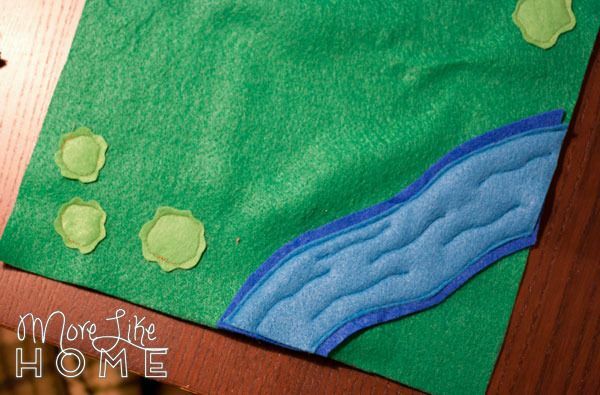 Use matching thread to sew around the edges of each piece to attach it, plus a few wavy lines down the river. 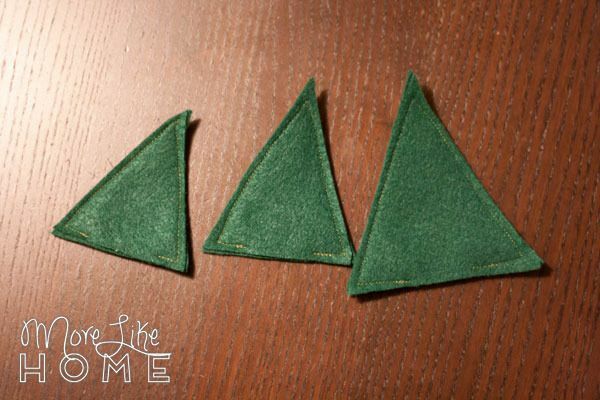 Next cut out some trees (you need two felt pieces for each tree). The pattern piece will make the larger size tree for a regular 2" peg, but I also had a couple smaller pegs to use up so I cut some trees a little smaller. 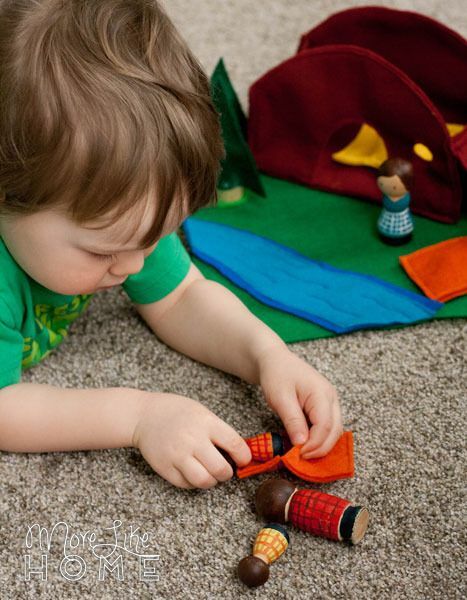 Stack two tree pieces together and sew around the sides of the tree, leaving the bottom mostly open. 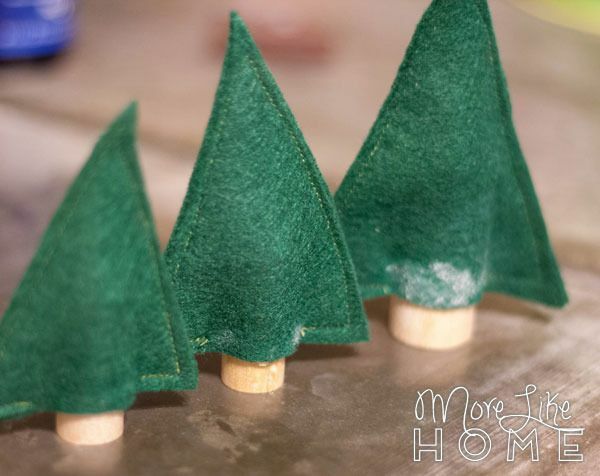 Insert a peg into each tree, leaving a little stump sticking out at the bottom, and glue the tree to the peg. I tried super glue at first, and it all soaked into the felt without actually gluing it together. Plus it dried white (see the tree on the right below). Hot glue worked much better for my other trees! 4 pieces using the tent pattern. Two should be cut solid for the back, and the other two should have the door and window cut out for the front. 2 floor pieces 8 x 4.5"
2 top pieces 10.5 x 5"
Stack the two front pieces together and sew around all the edges and any openings to connect the two pieces together (see the pic below). Make the back, bottom, and two sides in the same way. Lay the the tent front on the tent bottom with wrong sides together. 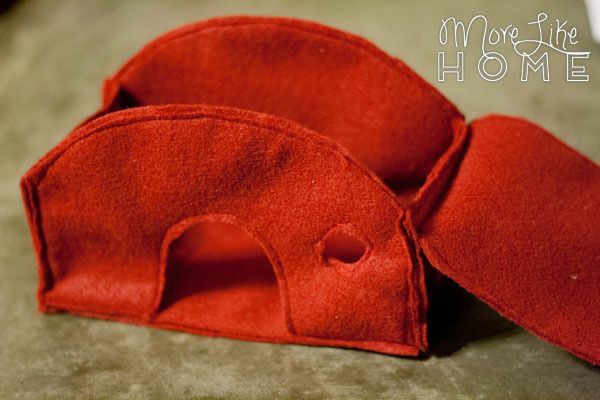 Sew right along the bottom edge to attach the two pieces. 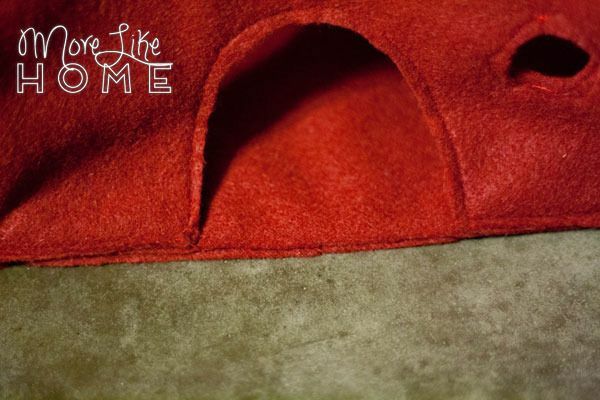 (The seams will be on the outside of the tent when you are finished.) Lift the front out of the way and lay the tent back on top of the tent bottom (line up the bottom of the side with the back edge of the bottom). Sew right along that edge to attach it as well. Lift the back out of the way and lay one of the sides on each end of the tent bottom (wrong sides together) lining up the edges, and sew along the bottom edge to connect each side to the base. 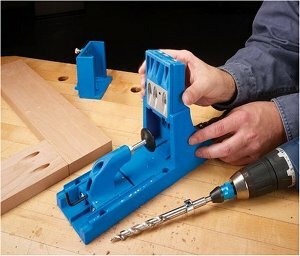 Now you'll have all the sides connected to the base. Stand the sides up and connect the corners. 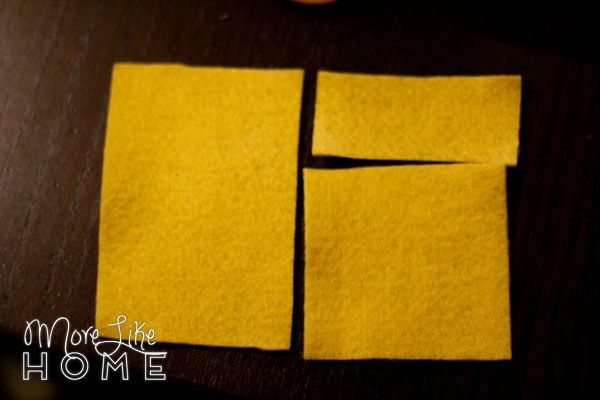 Pin each corner with the wrong sides together, then stitch along the edge to connect the pieces. Now you just need to make the roof! Start by stacking the two roof pieces together. Use scissors to round the corners a little. 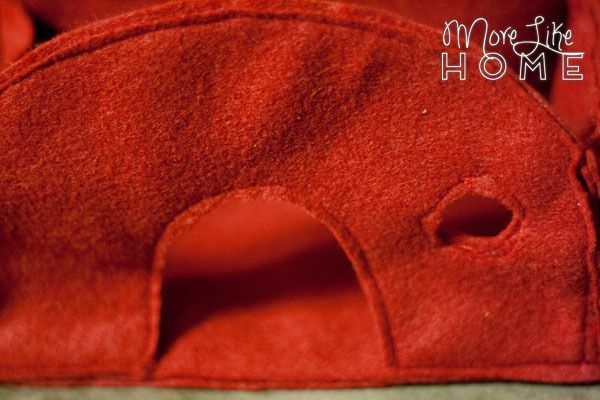 Sew around the edges to connect the two layers together. Center the roof over the top of your tent. 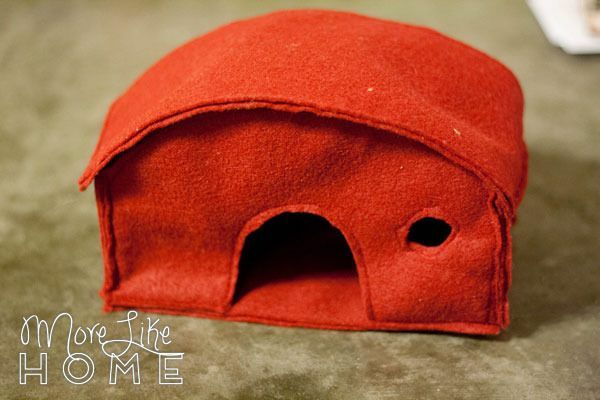 Sew along where the roof overlaps the side, but just on one end! 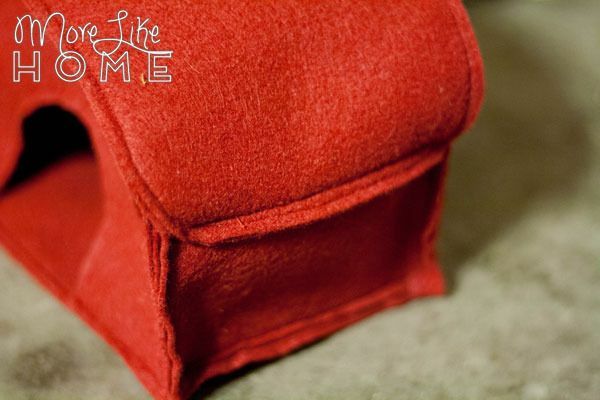 base - 3 x 4"
pillow - 3 x 1.25"
blanket - 3 x 2.75"
Place the pillow at the top of the base and sew around all four sides. 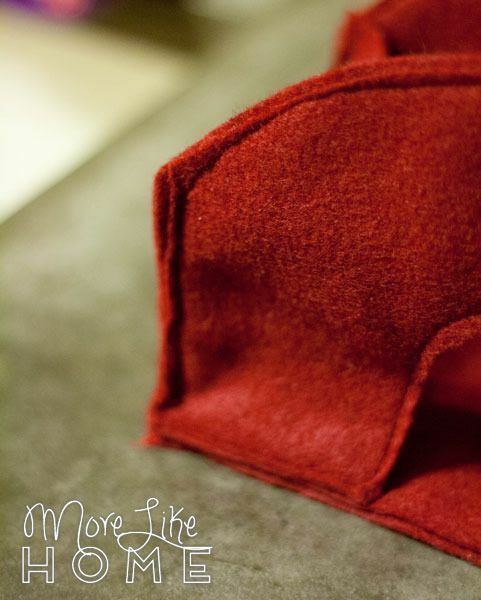 Place the blanket below it and sew along the sides and bottom, leaving the top edge open. 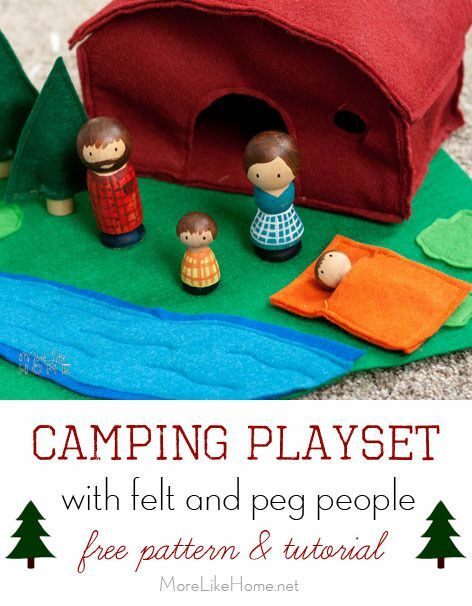 Don't forget to make one for each of your campers! 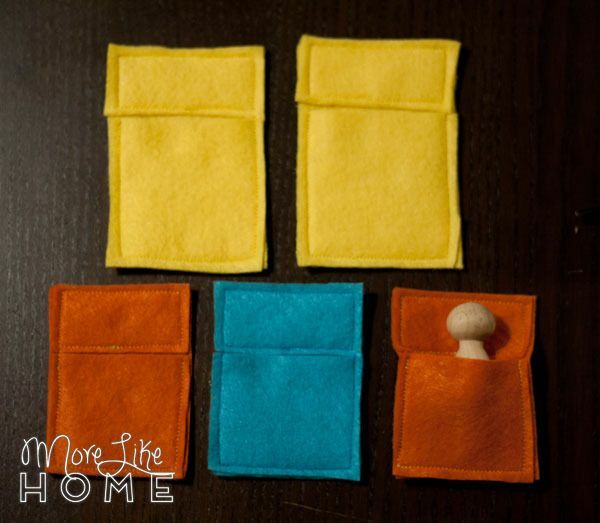 I made two this size for my adult pegs, but I cut the rest a little smaller to make child-size sleeping bags for the little guys. Now all you need are the campers! I started by drawing outlines with a light pencil before I did any painting, so I could just erase any mistakes. I let the natural wood show through for the skin, and just used a small brush to fill in my drawings for hair, clothes, and eyes. You can also seal them with a clear sealer. I didn't, but I think I'm going to add a sealer once it's nice enough to do it outside because they're getting pretty scuffed up already. 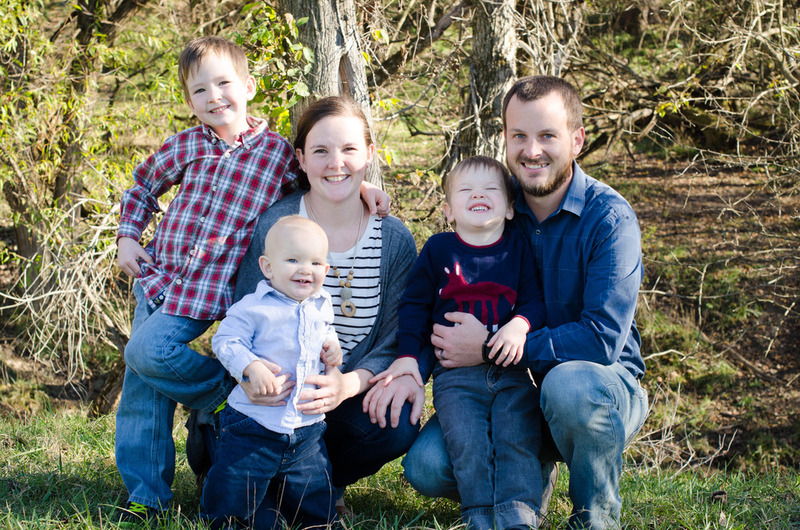 The boys could hardly wait for me to finish taking pictures so they could start playing again! The boys have been loving it! 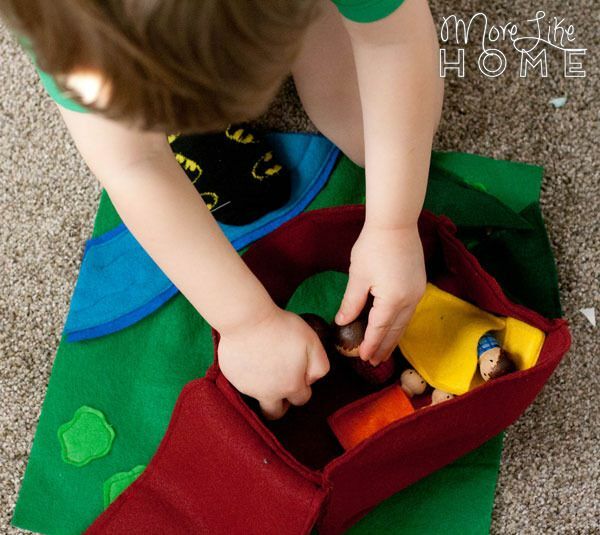 It's great for creative play, and it packs up small so it's perfect for travel. 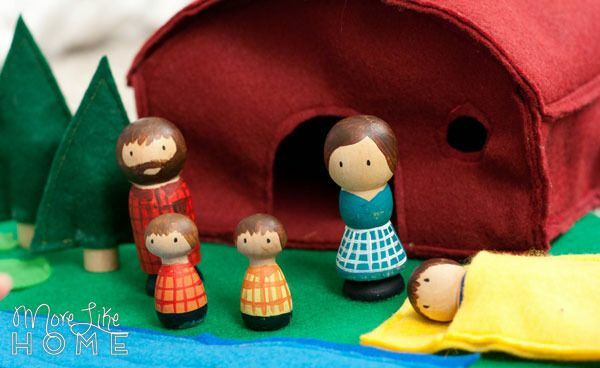 They've been enjoying it so much, I'm thinking about making some more peg playsets for their birthdays this year. Maybe a castle or a pirate ship? What kind of set would you love to make? P.S. 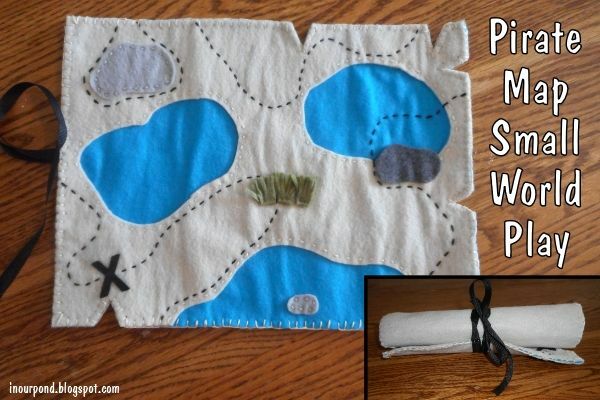 In Our Pond made this sweet pirate map version to use with Safari Ltd. Pirates! 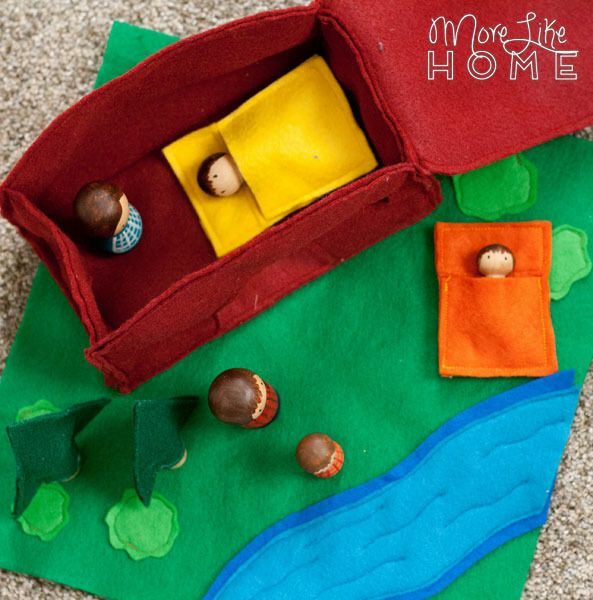 I'm definitely making one of these for my boys (they'll probably like using it as a map just as much as playing with the figures!). I can't wait to see more play sets! A zoo! I know a little cousin who would like to play. Thank you for sharing. I found this just in time to make for our camping trip. :) I'd love to see the castle if you make it. I'm really inspired by your camping mat. Thank you for sharing the pattern. I made a felt pirate map that I think your boys might enjoy. Oh my goodness, they would LOOOVE this. I'm going to make one for the next birthday! Could I share your photo and link up in my post? p.s. 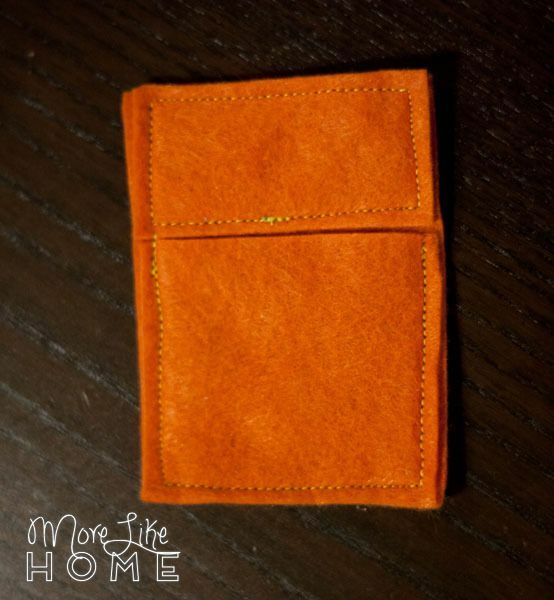 your hand stitching is beautiful!